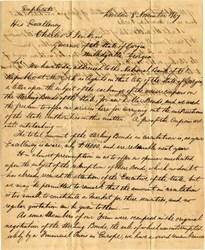 Original letter from the London financial firm Irving, Elsworths & Holmes to Governor Charles Jenkins of Georgia, offering their services in exchanging Georgia Bonds issued in Pounds Sterling with bonds issued in US dollars. The letter is signed Irving, Ebsworths & Holmes. Some signs of wear on folds. The sterling bond sale failed raise much money for the state of Georgia (15,000 Pounds) due to the 1866 financial crash in Europe caused by the failure of Overend Gurney & Co. bank, which brought down many otherwise healthy banks with it. 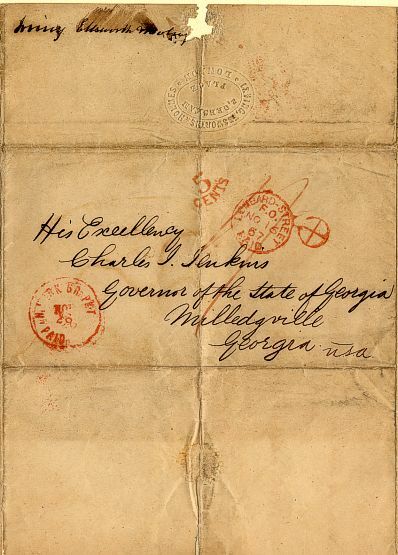 The original bonds were probably issued in Pounds due to Georgia starting over economically after the loss of the confederacy in the Civil War in 1865. 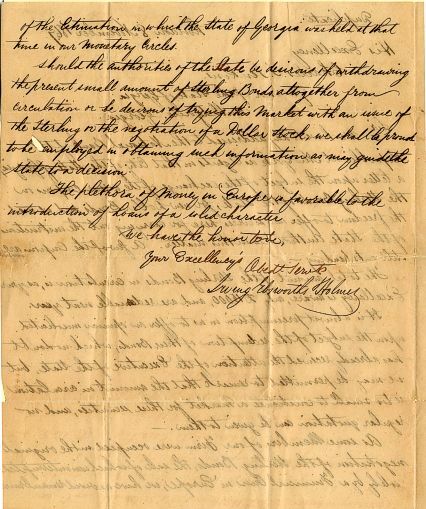 A side note about Governor Jenkins- he was deposed by the Union Army less than three months after this letter for refusing to use state funds to pay for a racially integrated election, and was replaced by Union General Thomas Ruger. We wonder how that affected any new bonds. Postal Cover Information: Cover appears to have the "N" English postal rate, a 15mm x 12mm "arc" 5/PAID mark in red, an 11mm crossed circle mark similar to a bishop's mark, a red 22mm single circle LOMBARD-STREET/PAID/F.O./NO 16/67 mark, and a double-stamped 26mm red mail packet mark dated NOV 26. Paper is also embossed with the Irving, Ebsworths & Holmes seal with the address 2 Gresham Place, London. Charles Jones Jenkins (January 6, 1805 � June 14, 1883) was a politician from Georgia, U.S..
Jenkins was born in South Carolina. His family moved to Jefferson County, Georgia, and Jenkins attended the University of Georgia (UGA) in Athens at a young age; however, his exact dates of attendance are not known. Jenkins left UGA before graduating and finished his education in 1824 at Union College in Pennsylvania. He first gained widespread attention as the author of "The Georgia Platform", a proclamation by a special state convention that cautiously endorsed the Compromise of 1850. In the 1852 Presidential election he was nominated for Vice President on a "National Union" ticket as a running mate for Daniel Webster. During the American Civil War, he was appointed by Governor Joseph E. Brown as a justice of the Supreme Court of Georgia. After a state constitutional convention in 1865 re-established Georgia's state government, he ran as the only candidate for governor. He served as the Governor of Georgia from 1865 to 1868, during Reconstruction. In 1868, he refused to allow state funds to be used for a racially integrated state constitutional convention that was supervised by the U.S. military occupation. In response, General John Pope installed Brig. General Thomas H. Ruger as military governor and Jenkins fled the state, though he later returned. In the 1872 Election, he received 2 electoral college votes. In that election, Liberal Republican candidate Horace Greeley died after the elections but before the electors convened and so two of the electors from Georgia cast their vote for Jenkins. He died on June 14, 1883. He was interned in Summerville Cemetery in Augusta, Georgia. Jenkins County, Georgia is named in his honor.